Locals say that Shelly bay Bermuda was named after Henry Shelly, one of the crew of the wrecked ship of Sir George Somers. 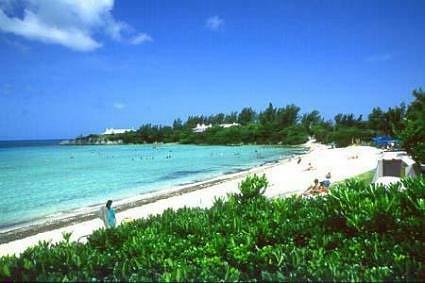 Somers was the first to come to Bermuda by the ship named Sea Venture and started the British colony in this island. The ship got wrecked on a reef near St. George. At this beach the ocean floor is sandy, and the waters are warm and clear. 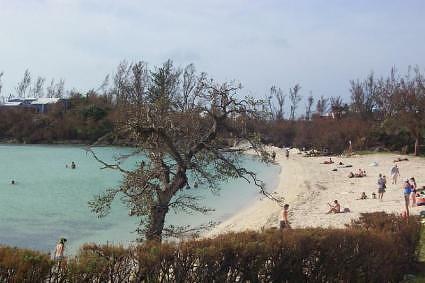 Here you’ll enjoy small tidal ponds and mangroves for shade, which is very uncommon for beaches on Bermuda. Although Bermuda offers some more secluded beaches that Shelly Bay the combination of natural setting, atmosphere and personality provided by this beach could be just what you are seeking. On windy days, it’s a favorite place for wind surfers to fly across the deeper water of the bay, out of range of swimmers. There are a children’s playground and park with many indigenous species of trees and shrubs; and a playing field for several organized sports near a former horse racing track. Shelly bay hosts a beautiful clean sandy beach which in my opinion is child friendly having a play area next to it. The day we were there it was particually wind and we were sand blasted but all in all its beautiful and we will be returning later in the year. The beach house has good food and a porch you can sit and enjoy the view while you have lunch. The beach is shallow going out to about 200 feet with white sand. Shelly Bay is one of the best beaches for small children. Our three year old enjoyed both, the shallow water and the playground. Our 9 year old loved being able to walk and swim out at least 50-60 yards without going over his head.